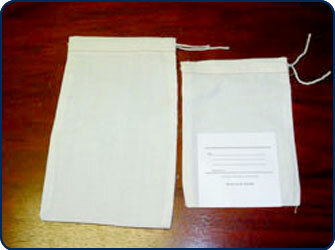 Made of the same sturdy material as the parts bags, these Midwest Pacific brand mailing bags have a sewn in mail tag and can be sent through the U.S. Post Office. The back of the tag is blank and can be used for notations or any other purpose. These drawstring bags are heavy enough to hold almost anything, yet still allow ventilation. Even the drawstring ties are made of cotton that will endure pull without breaking. These bags are great for storing or shipping parts, hardware, samples and countless other products. Available in standard sizes and also custom sizes for quantities of 3,000 pieces or more.